Three BR, 2 BA Home close to Notre Dame and SW Michigan wineries. Minimum stay 6 nights. Discount for weekly stay. Pontoon rental: $50 per day. Driver must have prior experience with pontoon. Greg owns a business in Niles. Connie is a RN and a clinical supervisor in a large physician practice. We work hard and play harder. We have 4 grown children and 9 grandchildren. Our guest home is in a great location. Edwardsburg is a small town but it is conveniently located within 5 miles of Indiana. Elkhart, Granger, Mishawaka and South Bend are very easy drives within 10-15 minutes of Edwardsburg. Garver Lake is a great place to relax. Most of the residents on the lake live here year round. 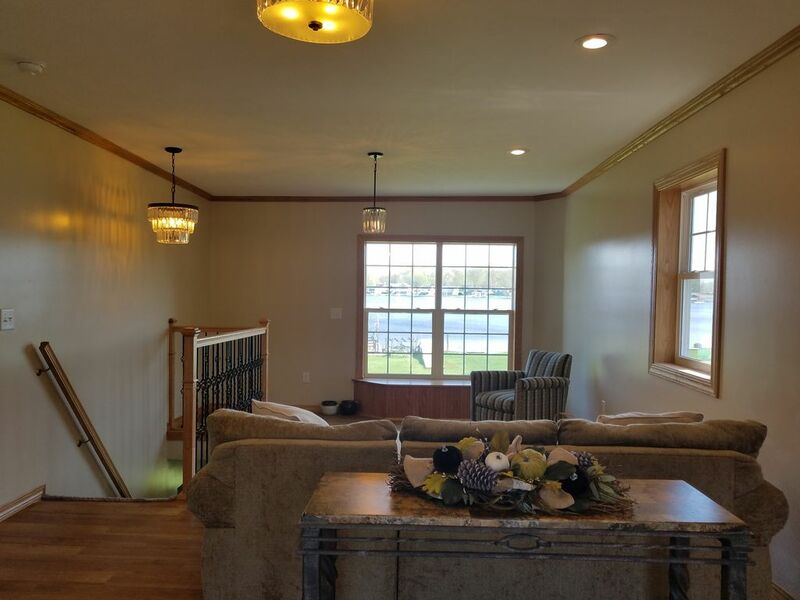 The guest home is within 45-60 minutes of Amish country and the Shipshewana Flea Market. Spend the day sightseeing and then come home and relax on the pontoon or swimming in the lake. Enjoy the sunset and a drink on the deck or the swing. Pontoon available for extra fee. $700 for the week or $200 for a weekend. We had a wonderful stay. The house is very nice and had everything we needed. We would definitely come back. Thanks. Thank you! We would love to have you back. And... Go Irish!! We stayed for a long family weekend, arriving on Thursday and departing Sunday late morning. The house was everything as advertised. The house has been recently updated, with all new fixtures and it’s done tastefully. The house is very well maintained, very clean and plenty of pots/pans/utensils to take care of most of your cooking needs. The beds are super comfortable, and the linens were freshly washed. Fishing on the lake was great. It’s a smaller body of water but that eliminates most of the traffic you find on bigger lakes. We caught some really nice sized bass, blue gills and perch. We rented the pontoon boat for an additional fee and it was perfect for getting around the lake and fishing for our party of five. And the location couldn’t be better. Plenty of places to run and grab food, Fat Cam’s is about a five minute walk down the street and great Louisiana fare. And most places in town are a 10-15 minute away. Overall, we were really happy with our choice to stay in Edwardsburg. Thank you, Connie and Greg, for opening your home to us. Thank you very much for your kind review. We're thankful you and your family had a great time and that you caught fish as well. We hope you'll consider us again next summer. We'd love to have you back. The actual property location is 25205 May Street. The address listed is our personal residence. We live 6 houses away from the rental home.